Special education teachers, psychologists, and other professionals use the KTEA™–3 to evaluate students academic skills in all aspects of reading, maths, written language, and oral language. This comprehensive battery was designed to assess achievement levels, track progress over time and help professionals determine why a student is underachieving. As part of a psycho-educational assessment it can assist in identifying learning disabilities as well as instructional needs. Results can provide links to appropriate intervention plans to address the student’s needs. Parallel forms A & B allow clinicians to measure progress over time and a student's response to intervention. Error Analysis is easily conducted and captured on one screen. 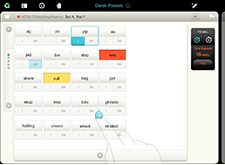 Tap-and-select mechanisms allow rapid capture of both responses and “time marks”. The student responds orally to items that require the application of mathematical principles to real-life situations. Skill categories include number concepts, operation concepts, time and money, measurement, geometry, fractions and decimals, data investigation, and higher maths concepts. The student writes answers to as many maths calculation problems as possible. Skills assessed include simple counting and number identification; addition, subtraction, multiplication, and division operations; fractions and decimals; square roots and exponents; and algebra. The student writes answers to as many addition, subtraction, multiplication, and division problems as possible in 60 seconds. Prekindergarten and kindergarten students trace and copy letters, and write letters, words, and a sentence from dictation. At grades 1 and higher, students complete writing tasks in the context of a grade-appropriate story format. Items at those levels include writing sentences from dictation, adding punctuation and capitalization, filling in missing words, completing sentences, combining sentences, writing compound and complex sentences, and writing an essay based on the story. The easiest items require students to write single letters that represent sounds. The remaining items require students to write increasingly difficult (regular and irregular) words from dictation. The student writes one sentence for each picture presented in the Response Booklet and completes as many items as possible within a five-minute time limit. This untimed test of silent reading comprehension includes several item types. Early items require matching a symbol or word(s) with its corresponding picture. Subsequent items require reading a simple instruction and responding by performing the action. Later items involve reading passages of increasing difficulty and answering literal and/or inferential questions about them. The most difficult items require rearranging five sentences into a coherent paragraph, and then answering questions about the paragraph. The student silently reads simple sentences and marks yes or no in the Response Booklet to indicate whether the statement is true or false, completing as many items as possible within a two-minute time limit. Early items require the student to point to one of three words with the same meaning as a picture and target word. 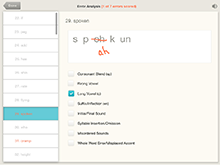 Each of the remaining items requires the examinee to read a sentence (silently or aloud) and say or point to the word in the sentence that has a similar meaning to the target word. The student applies phonics and structural analysis skills to decode nonsense words of increasing difficulty. The student responds orally to items that require manipulation of sounds. Tasks include rhyming, matching, blending, segmenting, and deleting sounds. The student says as many words as possible in 60 seconds that belong to a given semantic category. The student names pictured objects as quickly as possible during two short trials. The student names a combination of upper and lower case letters as quickly as possible during two short trials. The student reads isolated words aloud as quickly as possible during two 15-second trials. The student reads isolated nonsense words aloud as quickly as possible during two 15-second trials. Each item requires the examinee to listen to either a sentence read by the examiner (for the early items) or a recorded passage played via the iPad. After listening to each sentence or passage, the student responds orally to literal and/or inferential comprehension questions asked by the examiner. The student responds orally with complete sentences describing the photographs displayed on the iPad. As items progress in difficulty, one or two target words are required in the student’s response. The most difficult items require a response beginning with a phrase or target word(s).